Solitary Confinement Is What Destroyed My Son, Grieving Mom Says Venida Browder's son killed himself after spending time in solitary confinement. She's fighting to end isolation of youth in jails and prisons. A new campaign with that goal launches this week. 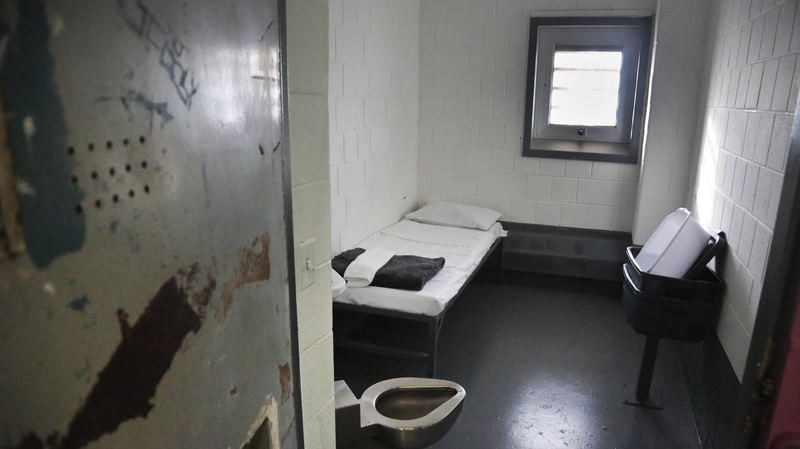 A solitary confinement cell at New York City's Rikers Island jail. This week, an unusual coalition of corrections officers and policy experts will come together in Washington, D.C., with one common goal in mind — to limit the use of solitary confinement for juveniles. The campaign has enlisted some powerful voices to warn about the harms of isolation for young people. Venida Browder lost her son twice: first to the lock-up at Rikers Island in New York, and then to suicide. "Solitary confinement is what destroyed my son," she said. Browder's 16-year-old son, Kalief, was accused of stealing a backpack. But he refused to plead guilty to something he said he didn't do. Instead, he spent years in detention, waiting for a trial that never happened. "He was a child being locked up for 23 hours a day for nearly two years," Browder said. "That's enough to destroy a man's mind, let alone a child's." Browder said her son tried to hang himself at Rikers. When corrections officers found him, he got a beating — and more time in isolation. Eventually, authorities dropped the prosecution. Kalief came home, got a GED and took classes at community college. But Browder said her son was struggling. "The look on his face — physically he was here, but mentally he wasn't," she said. "And it was too many days like that. It just overpowered him." Kalief Browder took his own life last year. Criminal justice researchers said that story is all too common. "Young people who are held in solitary confinement have the worst outcomes, and that includes being at very high risk of suicide," said Marc Schindler of the nonprofit Justice Policy Institute. Schindler, a former youth corrections administrator, is helping to lead the Stop Solitary for Kids campaign that will kick off at an event at the National Press Club in Washington on Tuesday. The coalition wants to end the use of isolation for juveniles, who are especially vulnerable because their brains are still developing. Its members include JPI, the Center for Children's Law and Policy, the Council of Juvenile Correctional Administrators and the Center for Juvenile Justice Reform. Too often, advocates say, facilities use solitary as a catchall — a place to house young people who won't follow the rules or as a warehouse for kids with mental illness. "People are increasingly seeing that the use of solitary confinement is a counterproductive approach," Schindler said. That includes people like Christine Blessinger. She is executive director of the Division of Youth Services in Indiana's Department of Corrections and works closely with the American Correctional Association. Blessinger has signed on to the national movement to sharply limit isolation for juveniles, a move she said Indiana started to adopt years ago. The state recruited staff who wanted to work with young people and had them wear polo shirts instead of police uniforms. "We actually redefined the purpose of isolation, using it just as a temporary response to behavior, you know, if the youth threaten or harm others, and then returning them back to general population programming as soon as possible," she said. Ohio, Massachusetts and Oregon have moved in that direction too. Earlier this year, President Obama banned solitary for the tiny fraction of young people in federal prisons. Venida Browder said that's all good, but there's a lot more work to do. "I don't want another mother to have to spend a lifetime sentence like I am," she said. "I mourn every day." She said she doesn't want to see any more children damaged like her son was.